Want to cut back on salt? Up the umami. The mysterious fifth taste is hard to identify, but not so hard to come by. Here’s how to get it. “The Flavor Bible” (a book I recommend to anyone who wants to up their cooking game) describes umami as a “savory or meaty ‘mouthfilling’ taste.” When we experience umami, our taste buds are responding to one of a few specific compounds. The best known of these is the amino acid glutamate. Glutamate is added to many foods in the form of monosodium glutamate (MSG), but it also occurs naturally in many savory foods, including meat, seafood and vegetables. It’s especially rich in fermented, cured and aged foods, but it’s also found in human breast milk — which could explain why we have an innate liking for umami! Because different compounds in food produce the umami sensation, when you have more than one present in the same food or dish they have a synergistic effect, making the food even more delicious. 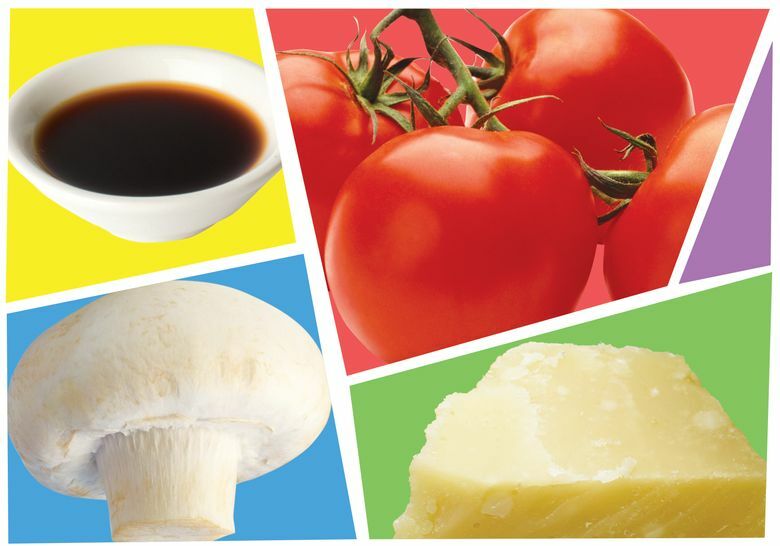 Classic examples include an Italian tomato-and-mushroom sauce with Parmesan cheese, Japanese dashi broth, French coq au vin, or chicken soup of various provenances. Umami’s ability to enhance flavor gives it a few distinctive health benefits, including letting us cut back on salt without reducing flavor. Including umami-rich ingredients in meals for individuals struggling with low appetite or diminished sense of taste may make eating easier. Mushrooms — especially dried shiitake mushrooms — are rich in umami, which isn’t too surprising when you consider that mushrooms taste somewhat meaty. A good rule of thumb is that the darker the mushroom, the more the umami. Dried mushrooms have more umami than fresh, and cooked mushrooms have more umami than raw. Adding sliced mushrooms to meat-based sauces or stews, or diced cooked mushrooms to burger meat before forming it into patties, adds another layer of umami while lowering fat and calories. Much like mushrooms, tomatoes are umami-rich, but dried tomatoes and cooked tomatoes are higher in umami than fresh tomatoes. Tomatoes are also rich in healthful phytonutrients. Soy sauce is a fermented food. The first time I saw a recipe for a mushroom- and tomato-based pasta sauce that used soy sauce instead of salt, I was hesitant to try it, but glad that I did, because it truly enhanced the flavor of the sauce. Soy sauce isn’t especially high in any one of the compounds that produce the umami sensation, so it appears that it’s the interaction between various components that give soy sauce its intense umami taste. Aged cheese? Yes, please! The beauty of aged cheese like Parmesan, Gruyere, Roquefort and blue is that they are so rich in umami compounds that you get maximum flavor impact with a relatively small amount. Save your Parmesan rinds and add a chunk to a pot of soup as it cooks (just fish it out before serving).